0x Protocol has been created with the conviction that most digital assets and goods will be tokenized. This paradigm shift needs to be supported by secure and sound technology, which is where is 0x Protocol comes into place. The project was founded in October 2016 and has been continuously progressing to become a plug-in with the ultimate goal of becoming the go-to decentralized exchange for the Ethereum ecosystem. In this article, we discuss this highly innovative project. 0x Protocol is an open, permissionless protocol allowing for ERC-20 tokens to be traded on the Ethereum blockchain. This means that 0x allows anyone to trade their Ethereum-based tokens directly on the blockchain, only cheaper and faster than possible on Ethereum’s blockchain. Essentially, 0x Protocol is a plug-in for Ethereum-based applications and smart contracts that require token exchange functionalities. Whether tokens are issued for capital, voting rights, governance or the many other functions they can have, they still need to be traded. Trading an ERC-20 token can be done on a regular, centralized exchange like Binance or Bittrex, or on one of the new decentralized exchanges such as IDEX or EtherDelta. Decentralized exchanges have major security advantages over centralized exchanges because the user always maintains control of his digital assets, can remain anonymous, and the exchange can’t be hacked. However, they often lack the liquidity and user-friendliness of centralized exchanges. Decentralized exchanges operate through the use of smart contracts, which allow each user to maintain ownership over his funds and allow the exchange to operate automatically. This does have a disadvantage though, since each transaction executes a smart contract which has to be paid for. This payment goes to the miners who are rewarded for verifying all transactions on the blockchain. On the Ethereum blockchain, this fee is paid in GAS and the total cost of fees becomes a large sum when a lot of transactions are made, which is exactly what happens with trading. Placing an order, selling, buying, depositing and withdrawing through decentralized exchanges all execute a smart contract and thus cost GAS. This is what 0x Protocol is changing. The protocol prevents high costs by allowing users to place their orders off-chain, which removes the need to pay GAS fees. Only the actual transfers of value occur on-chain, and are submitted to the Ethereum blockchain and paid for. What’s Behind the 0x Protocol? In 0x Protocol, orders are transported off-chain. To support this off-chain solution, relayers are vital to the 0x protocol. 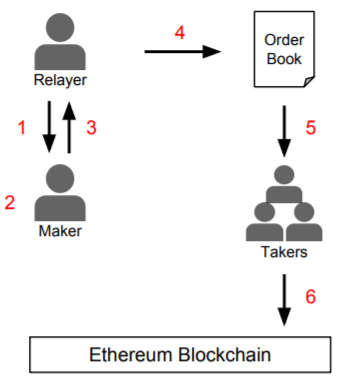 Relayers broadcast all the off-chain orders of the 0x network to the rest of the network to match buyers with sellers; thus they essentially act as an exchange. It’s important to note that relayers don’t execute the trade; they merely facilitate trading. They do so by broadcasting orders, which means submitting an order to the network. This broadcast order can be the order to sell tokens or an order to fill this sale. Once a transaction between a seller and a buyer is completed, the relayer receives a fee in 0x tokens (ZRX) and the transfer of value is submitted to the Ethereum blockchain. Anyone in the 0x network can become a relayer. Another neat feature of 0x is Point-to-Point Orders. This type of order allows a seller (maker) to directly trade with another party on any messaging system such as Facebook, Reddit or Whatsapp. These orders are secured because the funds are only transferred when the specified address by the maker is inserted by the buyer (taker). 0x Protocol is designed to be an open-source plug-in for Ethereum-based dapps that require an exchange function. This allows all of these dapps to easily integrate an exchange function, but also directly connects all dapps that are using the 0x protocol. There’s a growing list of dapps that will or are already using 0x Protocol, including Augur, Maker and Request Network. By using 0x Protocol, the tokens of these dapps become much easier to exchange on the Ethereum blockchain. You can directly trade your Augur token gains for predicting the right event for Maker tokens, in the Augur dapp. By connecting these dapps that have integrated with the protocol, the 0x application has the potential to increase the liquidity for ERC-20 tokens. Liquidity refers to the impact that buying or selling an asset has on the price of an asset. When you can buy large amounts of an asset without affecting the price, the market of that asset is liquid. Liquidity, or more accurately illiquidity, is a problem that a lot of decentralized exchanges and applications are facing. 0x Protocol can greatly assist in making markets more liquid by connecting all Ethereum dapps. Relayers can share a standard API with the network through which they share their orders. The more relayers start doing this, the larger the exchange network of the 0x protocol becomes. The 0x project was founded by mechanical engineer Amir Bandeali and income trader Will Warren. This leadership is supported by a team of 6 (blockchain) engineers and several other professionals in charge of recruiting and operations. The team has only shared general roadmap information for the first 2 quarters of 2018. 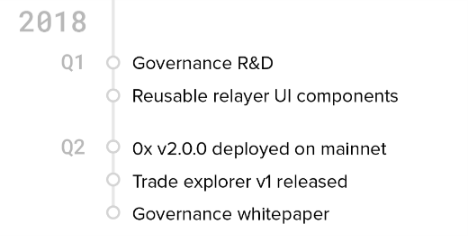 The general development theme seems to be oriented on improving the user interface and experience, and rolling out a sound governance system. The ZRX token is used to pay for relayer transactions, and as a means for network members to decide on proposals for the development of the protocol. 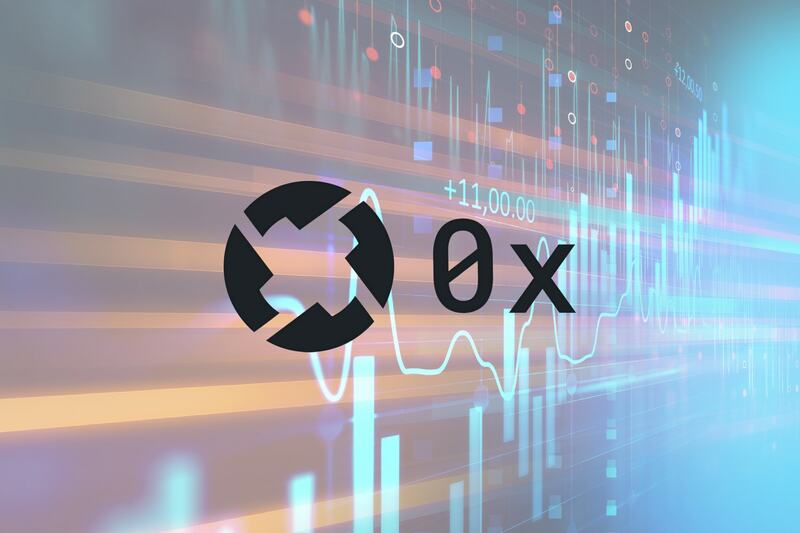 The latter indicates that 0x is employing a Proof-of-Stake algorithm where token holders can stake their holdings to vote on the future of the network. As the network expands, more relayer transactions will be conducted and more dapps will want to have say in the progress of the 0x Protocol. This indicated that there is a healthy correlation between the usage of the network and the demand, and thus value, of the ZRX token. You can buy ZRX at these exchanges and store them in any ERC-20 compatible wallet, such as MetaMask and MyEtherWallet. 0x Protocol has been created to make the exchange process of Ethereum-based tokens faster, cheaper, more liquid and decentralized. Through the use of 0x relayers, the 0x Protocol can actually pull this off and become the decentralized exchange backbone for the Ethereum ecosystem. As 0x is designed to be easily implemented by other dapps, the decentralized exchange will grow with every new dapp that has integrated the protocol. As soon as the governance model is completed and implemented, 0x Protocol can become a community-controlled exchange that saves its users time and money. For more information, visit the 0x website and their blog on Medium. You can also join their community on Reddit and Twitter.